Presented the ASIS&T 2002: Information, Connections and Community. 65th Annual Meeting of ASIST in Philadelphia, PA.
Chairman Emeritus, ISI, 3501 Market Street, Philadelphia, PA 19104. Institute of Marine Biology, Russian Academy of Sciences, Vladivostok 690041, Russia. Center for Teaching, Learning, and Technology Washington State University, Pullman, WA 99164-4550. There is a large literature on mapping and visualizing the scholarly literature (White & McCain, 1997; Buter & Noyons, 2001). However, none of these methods have been used to create historical displays of works on a given subject. The authors have developed a process and software called HistCite for generating chronological maps of collections resulting from searching the ISI Web of Science (WOS), SCI/SSCI/AHCI on CD-ROM or SciSearch on Dialog. Export files are created in which all cited references for source documents are captured. These files are processed by HistCite to generate tables of the most-cited works. Real time demonstrations of several topics such as bibliographic-coupling, co-citation analysis, gene flow, etc. will be provided. The HistCite software includes an expert system for detecting and editing errors or variations in cited references. Export Files of 1,000 or more records are processed in minutes on a PC. Ideally the system will be used to help the searcher quickly identify the most significant work on a topic and trace its year-by-year development. Even before the advent of the Science Citation Index in print the use of citation data to help write the history of science and scholarship was discussed. 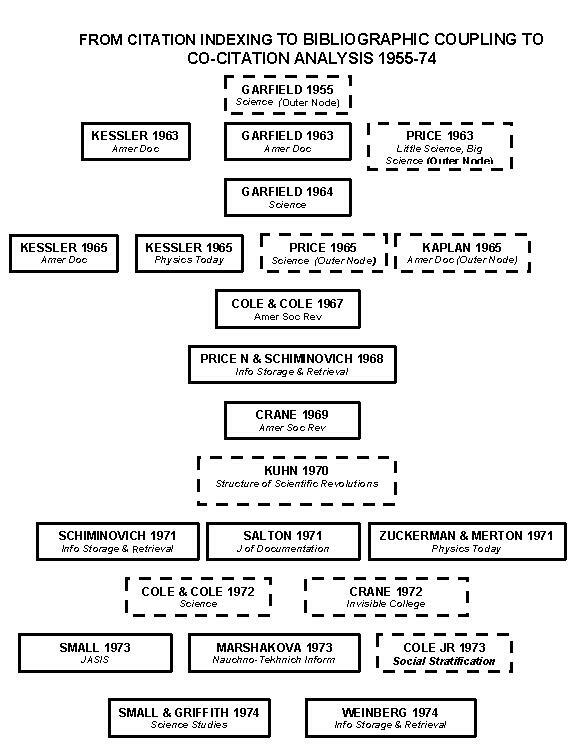 In 1964 Garfield, Sher and Torpie issued their report on "The use of Citation Data in Writing the History of Science� (Garfield, Sher, & Torpie, 1964) which included an historiograph of DNA's history from Mendel to Nirenberg. Flow charts of the many papers on this topic were created manually based on the references cited in a set of core source documents. Then, in subsequent years Garfield periodically reported on the potential use of citation indexes for historiography (Garfield, 1971). During the DNA History project, the idea of writing computer programs that would create such maps directly from the electronic files of the Science Citation Index was often discussed. This would require rapid random access to massive files that could retrieve both cited and citing documents in real time. In the 1960s, however, low cost gigabyte memories were still a dream. The implementation of real time mapping had to wait for the time when computer memories were large and cheap enough to handle retrospective files covering many decades of literature. While on-line searches were possible in the 1970s, mapping in real time was still not feasible because the PC had not yet come along. Only when the output of a completely linked large file of thousands of records could be handled by today's PCs did the creation of historiographs in real time become feasible. There have been many different types of �mapping� exercises performed on a small scale particularly with respect to co-citation clustered files of bibliographic information. In the past, clustering required main frame computers (Small & Garfield, 1985; Garfield, 1992) and in most cases still does. These ideas were later extended to creating small cluster maps on-line as in the SciMap system developed by Henry Small at ISI. In that mainframe system a starting paper is used to seed the creation of a co-citation cluster map (Small, Sweeney, & Greenlee 1985; Small, 1994). In spite of the many mapping and visualization techniques available none of them were applied to the creation of historiographs. Indeed, none of the many authors on co-citation mapping considered the significant relationship between historical display and its potential role in evaluating the output of searches with Science Citation Index (SCI), Medline, Chemical Abstracts, etc. From the earliest days until quite recently, we thought of creating historiographs by seeding one or two primordial papers. 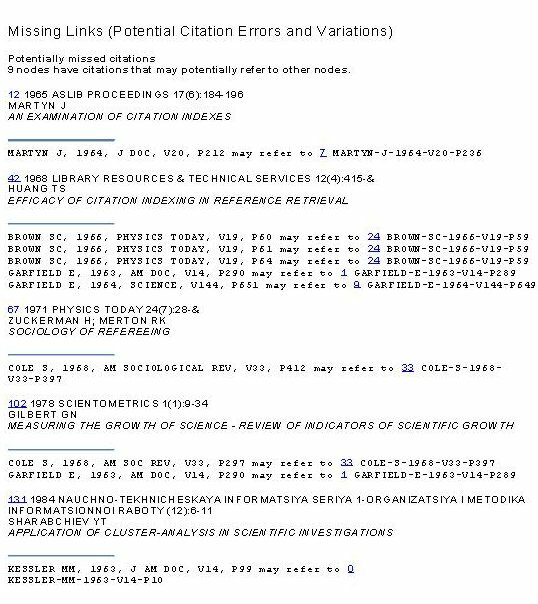 Then the Science Citation Index would be used to trace forward in time all the papers that had cited the starting references. This is the essence of doing what has now become a traditional cited reference search. Indeed, the basic purpose of an historiograph is to display the chronological development of a topic or field -- from the primordial paper forward, year by year. This notion was also influenced by the fact that the published SCI appeared annually both in print and on CD-ROM. And such searches could be amplified by cycling, that is, searching forward and backwards on cited references. In contrast, traditional literature searches are focused on retrieving the most current material and then working backward. Our initial experiments involved the use of the annual CD-ROMs to perform a cited reference search on a single starting paper. All papers that cited it the first year were retrieved. Then a further cited reference search was done on those citing papers. The process was iterated for as many years of the literature as was necessary. For each year of the literature searched there would be 0 to N papers retrieved. The full SCI Source record for each of the N papers would be captured including not only authors, titles, journal, volume page and year, but also their lists of cited references. If we assume that there are 20 cited references per source paper then there would be 20N cited references collected. The purpose of these multigenerational searches is to build up a file of relevant source documents together with a much larger file of cited references. Thus, if the collection involves 500 source papers, the list of uniquely cited references will be from 5,000 to 10,000 items. The HistCite program described herein sorts cited references to create a virtual mini-citation index. In addition, a variety of sort keys are used to create ranked directories of authors, journals, and citation frequency. 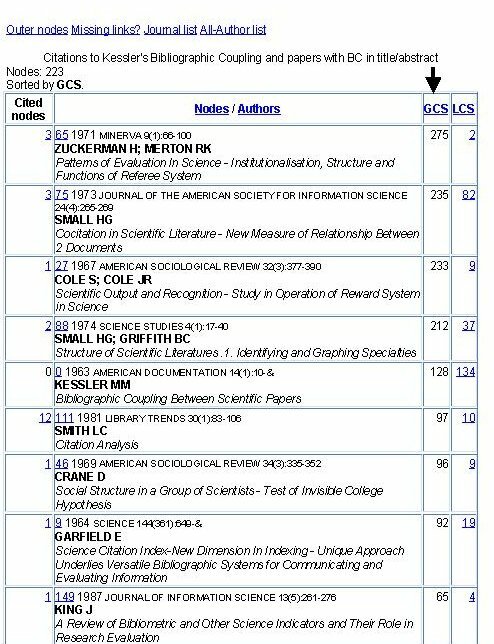 The mini-citation index is sorted to determine the citation frequency within the collection for each uniquely cited document. If 1,000 different papers or books have been cited then the average frequency will be 10. However, the range of citation frequency would run from 1 to 1,000. The system also creates a series of tables or matrices which list all the 500 source documents, each of which is assigned a number from 0 to 500, 0 being the primordial paper in a citation-based search or the oldest in a keyword-based search. The table is arranged in chronological order. Since the record for each source document contains its citation frequency, both within the local mini collection and the global SCI, these data can also be used to create tables sorted by citation frequency. This identifies groups of core, high impact documents that are cited above an arbitrarily chosen threshold. If there are 500 source papers then a 5% selection threshold would produce 25 core papers. These core papers are of prime interest especially to a searcher who is not familiar with the subject matter. The core list contains those candidate papers one would examine first in reviewing the topic. The coordinates of these papers will also be used later to create an historiograph of the topic which displays each of the papers and their citation links chronologically. As stated earlier, it was initially assumed we would begin with one primordial paper. However, it became apparent that one could feed in groups of papers by one or more authors � and by extension, larger clusters of papers by institution or by key word. Thus the output of any conventional search or a combination of citation and key word searches could be input to the system. Once the input bibliography is created, the core papers on the �topic� can be identified. The production of the various tables or lists from these procedures is of course separate from the problem of visualizing these data in the form of maps or graphs. These artifacts aid in the visual perception of the interrelationships between citing and cited papers. Creating maps of related documents presentS problems in display due to the limitations of space and restrictions of the 8 x 11 piece of paper. Visualization is aided by using larger pages. However, the advent of computer display screens means that one can create a virtual display of unlimited size. In future versions of the software, segments of the chronological maps will be shown in a movable display. Using mouse clicks and pop-up windows one would first show a condensed version of a large map in which the main nodes are visible but intermediate nodes are not. Thus a map of several hundred nodal papers would first be seen in a condensed version in which only 25 to 50 nodes are seen, perhaps the most cited papers in the collection or the most-cited in a particular time period. The full map could be observed in chronological sections from top to bottom or from left to right. Essentially one goes from a standard two dimensional display to a moving interactive multi-dimensional display. The combination of computer with human selection permits the algorithmic real time visualization of the historical connections between documents on a micro or macro level and identifies the most significant nodes. Thus the user can quickly perceive the historical connections between the core documents. The system could also include classification tags or research front identifiers that would permit one to recognize a larger cluster or category of which each paper is a part. While the initial system is limited to processing source records containing index tags and abstracts, entire texts of documents or Internet links could also be included. In that way it would be possible to observe the contextual significance of each citation as illustrated by the work of Steve Lawrence (Lawrence, Giles, & Bollacker, 1999). In our initial implementation of the HistCite system, records from the Science Citation Index have been used. The initial implementation produces numerous basic indexes based on year, author, journal, local and global citation frequency, and missing links. Other tables will be added in future versions as e. g. title or key word lists which identify the most used terminology. Significantly, the system also produces frequency ranked indexes of outer references, that is, cited papers and books that fall outside the starting collection. These are works which do not turn up in the original search but are cited in the collection. The user can examine these candidate references and decide whether to add them to the nodal group. For example, a highly cited book or patent might be cited which is not part of the original SCI source database. For each of these a source record would have to be created. Some of these items may in fact have been published prior to the starting reference. In the latest version of the software a module has been added which provides a semi-automatic look-up of the full source record for each outer reference that is included in the SCI. Similar hotlinks could be provided to other databases. Once the full record is found, it can be added to the original bibliography and the software invoked to create a new matrix or map. The size of the outer reference list can be specified by the user and may even run into the thousands. It is well known that authors cite references with many variant spellings or make errors in one or more parts of the reference such as volume or page. These �missing� references are identified in a separate table. As part of the procedures invoked, the program will seek out the closest matched document in the collection and suggest candidates to examine. This can be done manually or by an expert system which e.g. 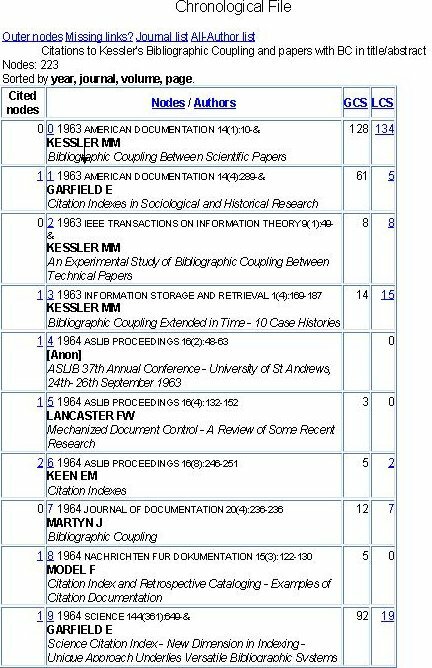 adds a missing volume number to a citation that is otherwise identical for author, journal, year and page. In a large number of references the page cited will not be the first page. In many chemical papers when a chemical compound is mentioned, the exact page is cited. If that page is cited often, the user may wish to treat that as a separate source. Otherwise, the page number could be changed or deleted, so that it will be included in the citation frequency score for the fully paginated reference. If it is a duplicate, it will be deleted when the program is run a second time. To reiterate, an expert system facilitates the process of editing errors or variations so that they can be integrated with the main collection. Fortunately the number of such errors or variations is normally quite manageable. The reader can edit them or not. Most are singletons that ordinarily will not affect the overall ranking or mapping results. All of the processes described with respect to the SCI can of course be extended to output data from other databases but in one way or another the source documents should include cited reference links. This could be done by matching non-SCI files with SCI data or by manually or electronically extracting cited references from the full texts of papers to which they are linked. CAS, PscychInfo and other data bases now provide links to full texts. The entire full text of over 100 years of Science, Physical Review, etc. is now available as are more recent years of thousands of journals on vendors such as HighWire, JSTOR, Ingenta, and elsewhere. In all these cases it is necessary to standardize the formats of cited references so they can be consistently processed by the system. For that reason conversion programs can be included which take data in their original format and converts them to the required system format . At present, the program accepts export records from either the SCI CD-ROM. the Web of Science or SciSearch on Dialog However, Dialog records do not include the GCI. The basic coden of name, journal, volume, page and year is sufficient for most cited eferences. However, in the source records it is helpful to include the date or issue number to better separate papers chronologically especially for fast moving topics. In the examples which follow the collection was created by searching the Web of Science. The files were obtained by doing either a title word or cited reference search. The resulting collections were downloaded in the WOS EXPORT format which is in plain ASCII text. The plain ASCII text file containing the collection is processed by the program. The output is then presented in html. The HistCite program can reside on the user�s hard drive or a server. The initial output of the system is the master table sorted in chronological order (see Figure 1). The first primordial document is labeled 0 and the remainder following from 1 to N. A click on the node number opens the complete source record. In addition to the basic chronological �home� table several sorts can be called out. These are activated by clicking on the hot links.The first is the Local Citation Score (see Figure 2). This local score (LCS) is based on the citation frequency within the basic collection. A second display, (GCS), sorts by the global citation frequency, that is, how often each paper is cited in the entire SCI (see Figure 3). These sorts are quite useful in performing literature searches as the reader can view immediately the core papers on the topic, that is the highest impact papers. Figure 4: Authors ranked by number of publications. 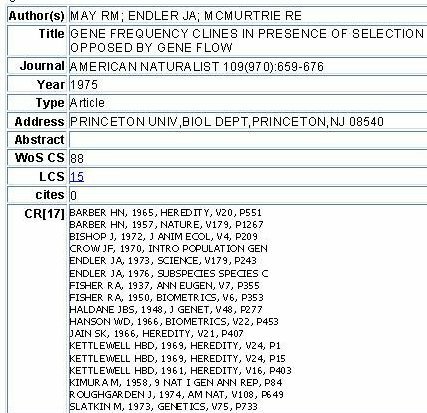 Figure 4 lists all authors in the collection. The most published author is at the top. Hotlinks permit the display of the authors by global or local citation frequency. Thus the most-cited authors, as distinguished from the most published authors can be shown. The individual citation frequencies for these papers are totaled. 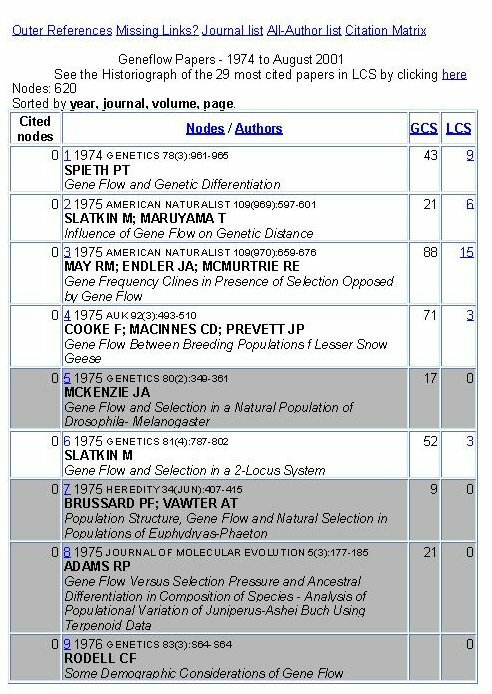 In Figure 5, the journals in which the papers were published are displayed. 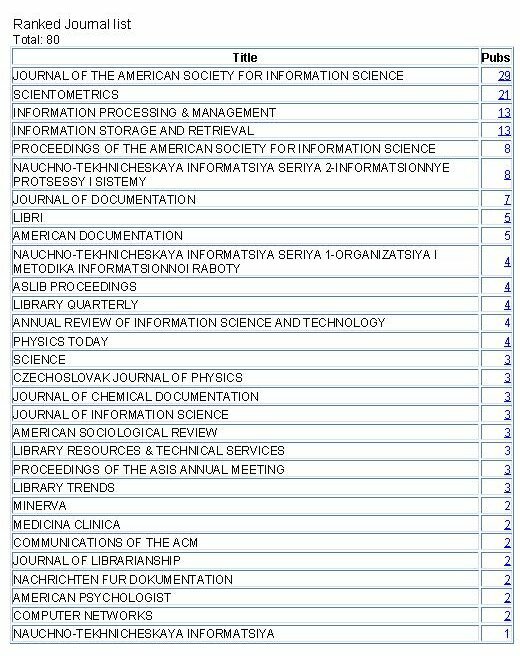 At the right is shown the total number of papers for that journal. 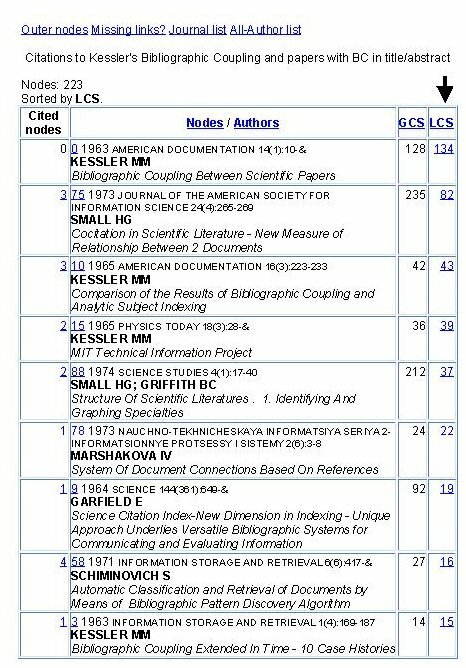 Figure 6: Outer nodes � most cited works outside original bibliography. 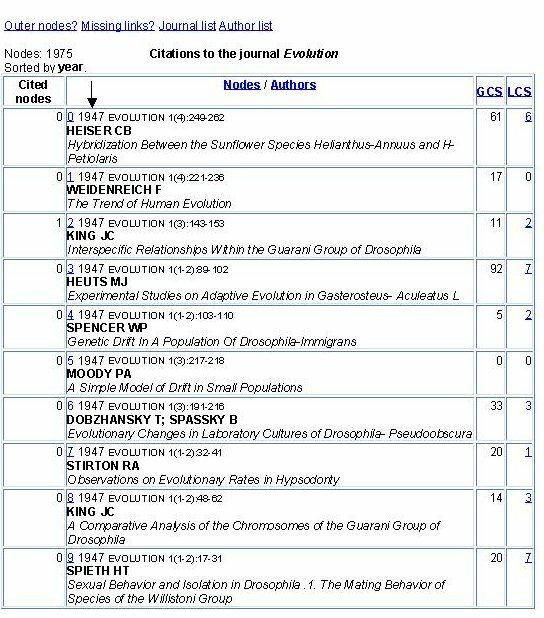 The �outer nodes� link lists the thousands of cited references that are not part of the basic collection or bibliography (see Figure 6). These "outer nodes" include books, patents, etc., as well as papers not included as sources in the SCI. They are sorted by citation frequency in the local network. The user can choose to retrieve such items and provide the missing source data for those that are cited above a given threshold. Once identified and expanded to include their list of cited references, full bibliographic data for these nodes can be added to the basic collection. The program is run again so that the new papers are integrated into the collection. A semi automatic look-up of each item can be activated if the user has access to Web of Science by clicking on WOS. These outer nodes can also be scanned with the FIND command to locate all variant citations for the same cited work . The system identifies questionable or �missing� citations where there is reason to believe there is an error or variation that prevents unification (see Figure 7). This expert system permits the reader to correct errors of omission in volume, number, year, pagination, etc. Once corrected, these items can be fed back into the file so as to refine the data and complete the citation counts and maps. In the example shown for T. S. Huang�s paper, he has cited specific page numbers in the same article by S. C. Brown. For bibliographies up to 1,000 papers, the mapping procedure takes approximately one minute, that is, once the output bibliography is downloaded from WOS. Using the latest version of WOS approximately 150 records can be exported at one time. Thus to accommodate 1,000 records, one would have to run the search in seven or eight segments, depending upon the number of references cited . The various outputs are cut and pasted into one consolidated export file. HistCite eliminates any duplicates encountered. We have tested the program on files as large as 5,000 papers. In one case, all papers were published in a single journal � Evolution (see Figure 8). In order to create a pure chronological display, the sort key has to include not only volume, page and year, but also issue number. As is well-known, the WOS output file is arranged in approximate reverse chronological order based on production input. The ISI production procedure involves the input of records that are often asynchronous with the original dates of publication. Thus a December 2000 article may appear in the WOS in January 2001. And due to timing variations in adding back issues to ISI files, it is not possible to rely on the WOS, at present, to produce an absolute chronological arrangement. While the HistCite program will produce a nearly perfect sort for a single journal's records, it is not possible to create an absolutely reliable chronological file for a collection covering articles from many journals since volumes are not correlated with exact publication dates. However, the monthly or weekly dates are included in the original WOS records. In fast moving fields it might even be better to use the date the manuscript was received to more accurately portray the sequence of rapid developments. In order to help the user better visualize the inter-relations between the thousands of cited papers in the network, the software creates a citation matrix which displays the nodal number for citing and cited works (see Figure 9). This matrix can then become the input for the creation of citation maps of various kinds. In the first public demonstrations of this system (Garfield, 2001), we showed some maps created by Howard White of Drexel University using his co-cited author software as well as critical path software. However, our system includes a mapping procedure that produces a pure chronological listing of the 50 core papers selected by the user. 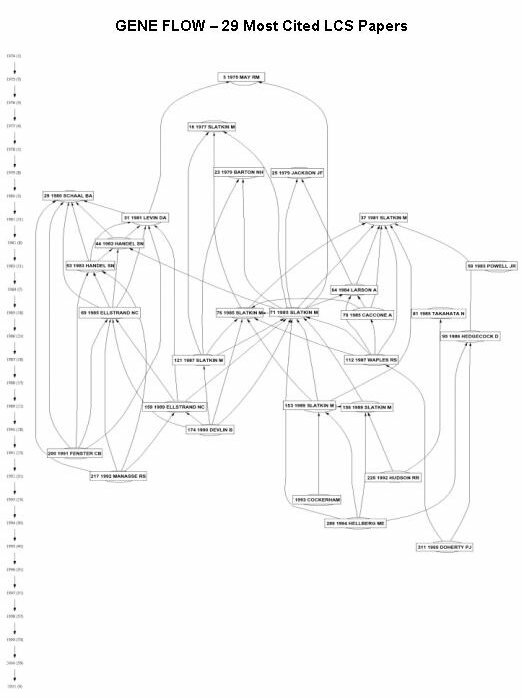 Figure 10 is a manually created map on bibliographic coupling based on the data compiled by the program. In the oral presentation, most of the figures will be demonstrated dynamically. The subject of gene flow, is of considerable interest to one of us (Pudovkin). 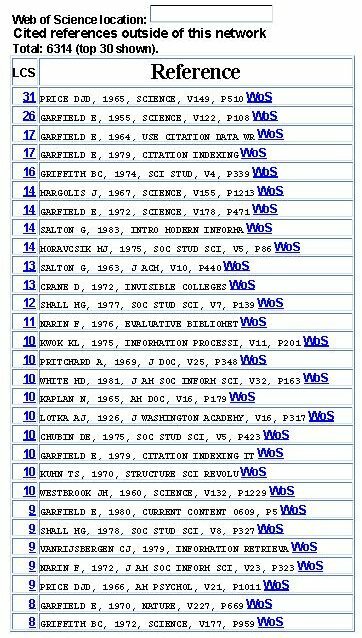 Instead of a cited reference search, we conducted a typical search in WOS using the simple title word search on �gene flow.� 620 papers were published on this topic between 1974 and 2001. Figure 11 shows a portion of the full chronological collection. 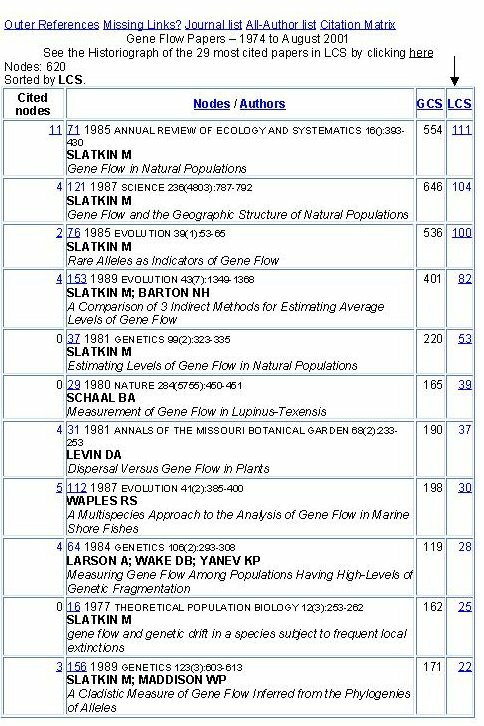 Figure 12: Gene flow collection sorted by Local Citation Score (LCS). These were used to create an historiograph of the field (Figure 12). Only a portion of the 29 papers cited 10 or more times is shown. Figure 13: Computer generated historiography of �gene flow� most-cited papers. The genealogical graphical presentation is seen in Figure 13. Note that each rectangular node is hotlinked to a full source entry (Figure 14). 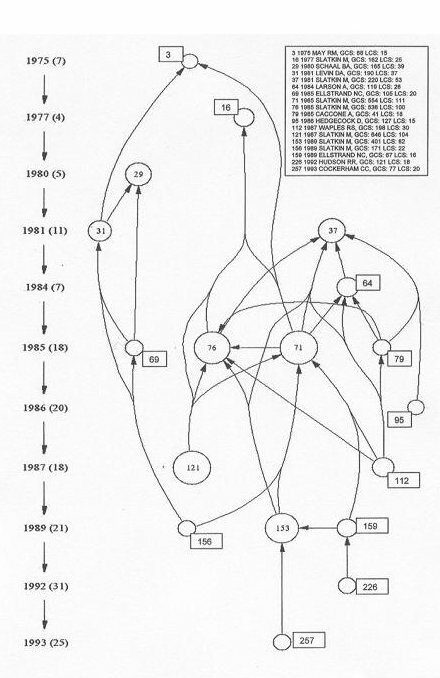 Figure 14: Full source entry for node #3, paper by R. M. May, American Naturalist, 1975. 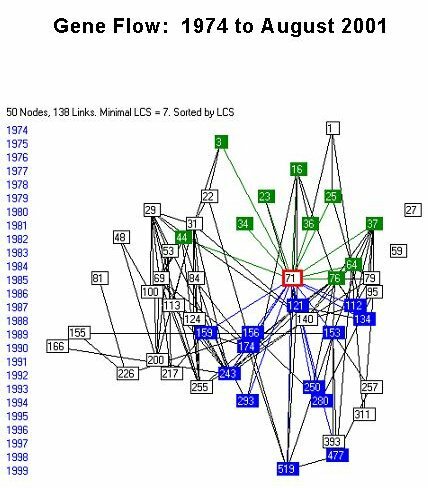 Node #3 at the top of Figure 13 is Richard May�s 1975 paper in the American Naturalist. Figure 15: Gene flow collection with each paper represented by a circle proportional to citation frequency. 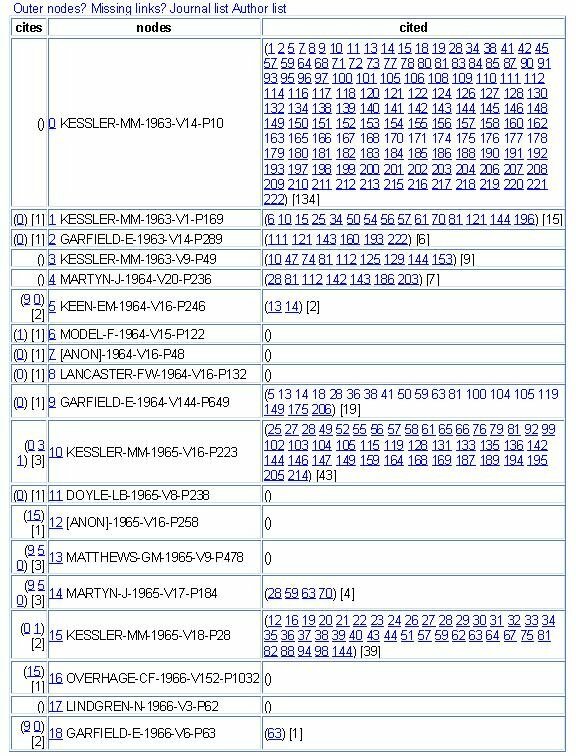 In Figure 15, the source set of 29 papers is shown in another format. Each document is represented by a circle whose area is proportional to its citation frequency. Ultimately, both characteristics will be included in the map. In conclusion, we have described a tool which permits the user to manage the voluminous references produced in a comprehensive search of the literature. For those who are new to the subject, the mere juxtaposition of the most-cited papers for each five- or ten-year period of the literature will help identify the key literature to be used first.For those who are knowledgeable in the field, the system will help jog the memory to recall the key works which were associated with the development of the field. While the relevance of citing works may be apparent, the collective bibliographic coupling and co-citation of papers in and outside the basic bibliography should provide a comprehensive structure for completing a synoptic history of the topic. NOTE: Only a portion of the tables were shown during the oral presentation. This paper has the complete slides, and more readable versions of the graphs. Butler, RK. and Noyons, E.C.M. (2001). Improving the functionality of interactive bibliometric science maps. Scientometrics 51, 55-68. Cawkell AE. (2000). Visualizing Citation Connections. In B. Cronin & H.Barsky Atkins (Eds), The Web of Knowledge: A Festschrift in Honor of Eugene Garfield (ASIS Monographic Series) (pp. 177-194). Medford, NJ: Information Today, Inc.
White, H.D. and McCain K.W. (1997). Visualization of literatures. Annual Review of Information Science and Technology, 32, 99-168. Small, H. and Garfield, E. (1985). The geography of science: disciplinary and national mappings, Journal of Information Science, 11, 147-159 (1985). Reprinted in Garfield E. (October 27, 1986) Current Contents No. 43, 3-14. Reprinted in Garfield E. (1988). Essays of an Information Scientist . (Vol. 9, pp. 324-335). Philadelphia: ISI Press. Buter, R.K. and Noyons, E.C.M. (2001). Improving the functionality of interactive bibliometric science maps. Scientometrics 51, 55-68.